Your request has been heard and we are happy to announce that Bulk Text Messaging is here. Bulk text messaging provides marketers with the ability to write one text message and push it to any size group of phone numbers. Saving time and energy, while protecting individual users information from being shared. This is a great tool for announcing a flash sale, promo code for special offers or announcing an event. Select the tracking number for outbound text. Paste the list of numbers you’d like to text. 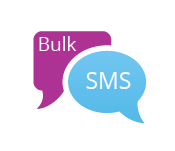 We’d love to hear how your company plans on using the Bulk Text Messenger- share your strategies in a comment below!